Whether you are starting a new press or you are an author thinking about self-publishing, you'll be confronted by a lot of questions. Publishing can seem overwhelming to those just beginning. Fortunately, there's help! Starting a press: Should I incorporate? What should I name my company? How can I get funding? Understanding book industry practices: Why do I have to discount? What are returns? How do I handle P.O.s? Do I have to pay for shipping? Producing a book or ebook: Do I need an editor? Can I typeset the book myself? How do I get a cover designer? Do I need to print or go directly into ebooks? The requisite forms and website registrations: What is Books in Print? What is Metadata? What is the difference between copyright and copyright registration? Marketing (without which, your book won't sell! ): How do I define my audience? What is a marketing plan? What is an author platform? Do I need a publicist? The Self-Publisher's FAQ Countdown: When am I supposed to buy an ISBN, write my marketing plan and send books out for review? In clear, no-nonsense replies, you'll find the answer to these and many, many other questions! 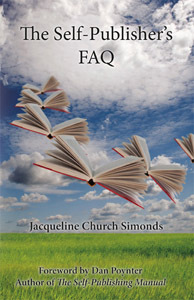 "Whether you decide to put out an ebook or a lavishly designed hardcover art book, do all the work yourself or hire publishing professionals, The Self-Publisher's FAQ is a great start to your publishing journey! "—Dan Poynter, author of The Self-Publishing Manual, from the foreword. Paperback book available via Amazon, Barnes & Noble.com, Powell's Books or order from your favorite bookseller—you can get via the Espresso Book Machine, too! Available soon as an ebook!